Coat chicken breasts with salt and pepper. Cook chicken breasts in olive oil over medium high heat on the stove for 3-4 minutes per side. A nice crust should form on each side of the chicken. Place chicken in a baking dish. Coat with salsa and squeeze half of the lime over it. Top chicken with cheese. Place in oven and bake for 15-20 minutes until chicken is cooked through (bake less time if using thin chicken breasts). While chicken is cooking heat black beans over medium heat. Squeeze the other half of the life into the beans. I also like to stir a little salsa into the beans while they are cooking, but this is optional. 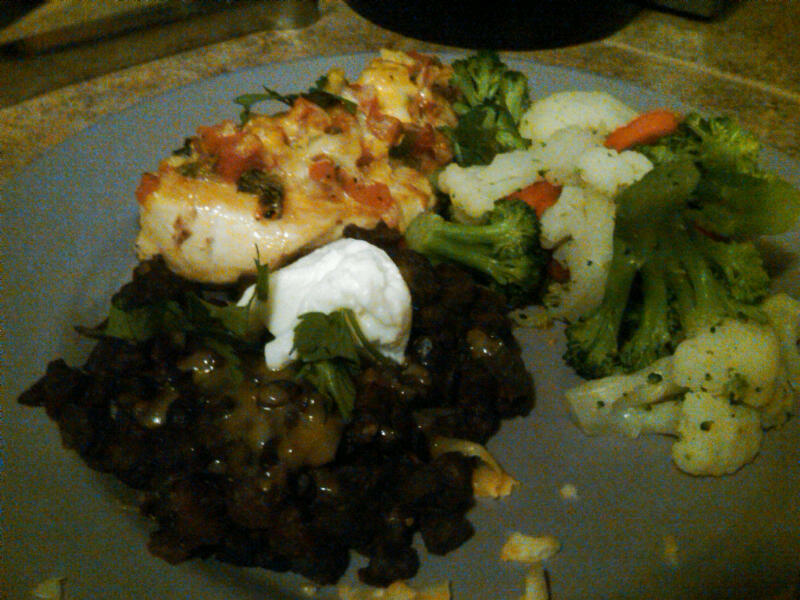 Place the chicken on top of the black beans on a plate. garnish with chopped cilantro and yogurt.